Trees that keep leaves in winter are known as evergreen trees. Evergreen trees do lose a small amount of their needle-like foliage during the winter; needles aged one to 17 years that are unneeded can be found near the trunk of the tree, and drop once a year, depending on the species. However, young needles that make up the majority of evergreens' foliage remain on the tree all year long. Pine trees (Pinus spp.) are a coniferous species, meaning they bear conical fruit called pine cones and foliage in the form of slender needles. Though growth rates vary between varieties, the fastest growing is the white pine, which increases in height from 8 to 12 inches annually. Pine foliage appears blue to dark green in color with a texture that is coarse or fine; cones are generally brown in color and have different sizes and shapes from tree to tree. Because they stay green throughout the winter, pines are widely used as a screen or a natural wind barrier. Pine trees thrive in full sunlight and moist, well-drained soil. They grow as little as 4 feet tall, as with some dwarf varieties, to over 100 feet, explains the Clemson University Extension. Varieties include bristlecone pine, limber pine, white pine, mugo pine and Ponderosa pine, among others. Junipers (Juniperus spp.) are a species of coniferous evergreen trees that keep their leaves in winter. 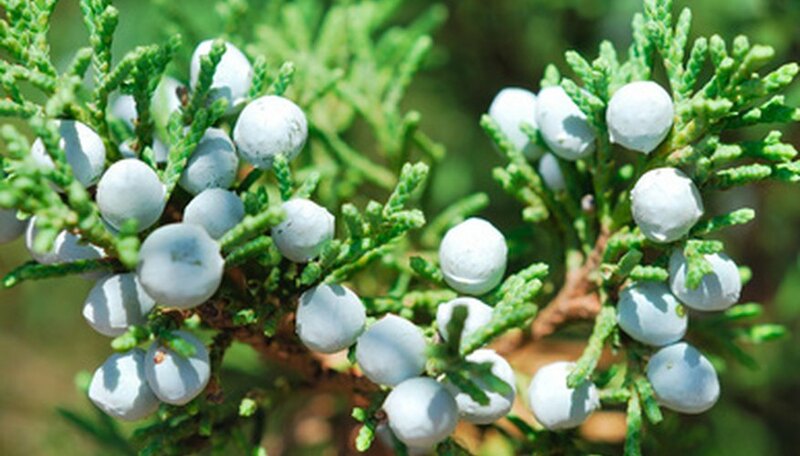 Junipers display "fleshy cones" and foliage that resembles either needles or scales, in hues of dark green to gray green; certain varieties bear small bluish berries. Some species of juniper trees can grow up to 50 feet in height with a width of 20 feet. Junipers are widely used as screens, hedges and natural wind barriers. The trees thrive in full sunlight and well-drained soil, and they tolerate many soil types as long as it's not excessively wet. Though pruning is fine, severe pruning may damage juniper trees, explains the Clemson University Extension. Tree varieties include ashe juniper, Eastern red cedar and Southern red cedar. Arborvitae trees (Thuja occidentalis) are evergreens that display needle-like or scale-like foliage in varying shades of of yellow, blue and green. Arborvitae trees come in a variety of sizes and shapes--dwarf to tall and pyramidal to round. They are widely used as screens or accent plants, explains the Ohio State University Extension. Thriving in full sunlight, these evergreens prefer moist, well-drained soil, and have a tolerance for both acid and alkaline soil pH levels. Varieties include Eastern arborvitae, American arborvitae or white cedar, and these are native to the northeastern region of North America. Arborvitae trees reach a height of 40 to 50 feet. Varieties include nigra, techny and woodwardii.